His graphite pencil lines were sparsely elegant. Expressivity entered by way of painted gestural forms, light and smeary but deliberately applied. 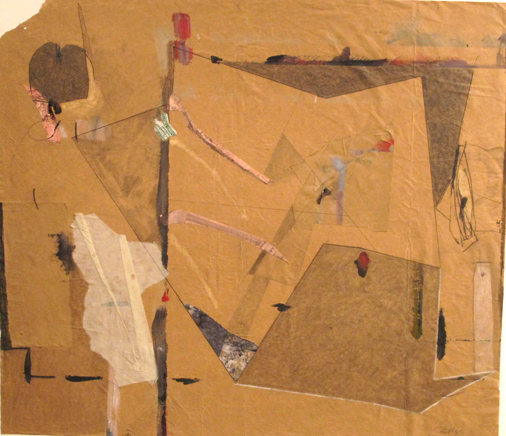 Collage elements were graceful rather than disruptive, and all was balanced on a ground of recycled brown paper. Instantly, my mind went to Malevich and Schwitters. 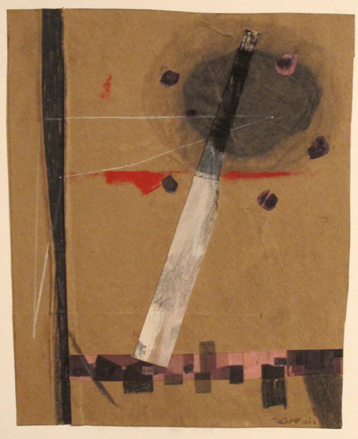 In 2011, Bob Russell showed eleven memorable drawings in The Modernist Thread exhibition at Williams Tower, and although his art was based on computer generated satellite imagery of the earth, it stylistically linked to early century masterworks, making it an unexpected response to organizer Sally Sprout’s curatorial theme of modernism. I’ll never forget graceful passages of crimson, cobalt and green against neutral-toned paper. Russell lived about two feet from the Menil Collection, so it was fun to imagine him scrutinizing the Suprematists and Tanguy and Ernst. “The art was influenced by my studies of the works of Ernst, Miro and Schwitters, along with many of the Russian pre-war artists,” he told me at the time. He continued to expand the series and on May 2 opened Earth Drawings / Subduction Zones at the Jung Center, a show of forty artworks of satellite images refashioned into lovely quasi-abstraction that is stylistically conversant with major trends in modernism. Upon seeing the art I contacted Russell to ask a few questions. Virginia Billeaud Anderson: I would have assumed art made with grinding technological advancements would be aesthetically uninteresting, but you made a fool of me. Tell me about it. Bob Russell: When I first started working with Google satellite images, I did a series of thirty 30" x 44" drawings on paper using oil pastels, graphite, and pencil, which were unlike any of my previous works because they were true to the actual satellite images, they were very representational. From those I did a whole sketchbook of abstracted studies, using the same vocabulary as the satellite series, but simplified. I used the same shapes, the same vocabulary of space and juxtaposition of forms, but abstracted and reworked. Two of the large black and white drawings at the Jung were large scale versions. For the earth drawings I decided to cut up the brown paper I had been saving. VBA: The brown paper suggests important innovations in modern art, evoking Schwitters, Picasso, numerous others. My mind likens its insistently neutral tonality to Malevich’s 1913 dark geometrics on white backgrounds. Let’s talk about the paper. BR: It is old, used paper. I pinned it to my studio walls to protect them from errant marks when working. It’s been used in several studios and it was wrinkled, folded, torn and rerolled hundreds of times. It was stored under a bed when we lived in the small space on Alabama, and I nearly threw it away but decided I liked the marks and pushpin holes, so I cut it up and used the marks and pin holes as a starting point, choosing like Duchamp in some of his work to let these marks, overruns of color and pin holes, serve as the genesis for these drawings. I call the marks erratics, as in Geology, they were not there originally but were placed there by unrelated circumstance. So I responded to the irregularities on the paper. I cut some into smaller sections. VBA: In some works you collaged in the actual satellite images, but their minute size requires a very close look to recognize that grid patterns and unordered organic forms are in fact aerial photographs of land plats, shore lines and cloud cover. Yet my psyche cannot accept your art as landscape. Ambiguity and non-representation removes it from objective reality and locates it in the realm of emotion. If here I’m insufferably poetic, at the very least you’ll agree you’re using symbolic language to speak of the Earth’s forces, which you stated definitively at the Jung. BR: Yes, I connected the dots, or in this case pin holes, to generate drawings of geometric forms that became a symbol of man’s footprint on the Earth. To me the forms were reminiscent of surveyed plats of property, farms, states, and countries, boundaries made by man. The wrinkles, marks, tears, creases and folds affected each drawing and added texture that related to the geology of the earth. I purposefully left tape and any foreign material on the paper. In the aerial perspectives my eye was drawn to the movements of rivers and their formation of oxbows, lakes, and changes in directions. Since reading John McPhee’s book Annals of the Former World , a geological tour of the continental U. S., the work has become more involved with those forces inside the Earth which are beyond our control, yet affect us immensely. So the drawings represent the aerial perspectives, but I allow that perspective to become blurred and altered, just like our earth. The art is an attempt to understand and reconcile the relationship between man and nature. VBA: Did you digitally modify the satellite images? 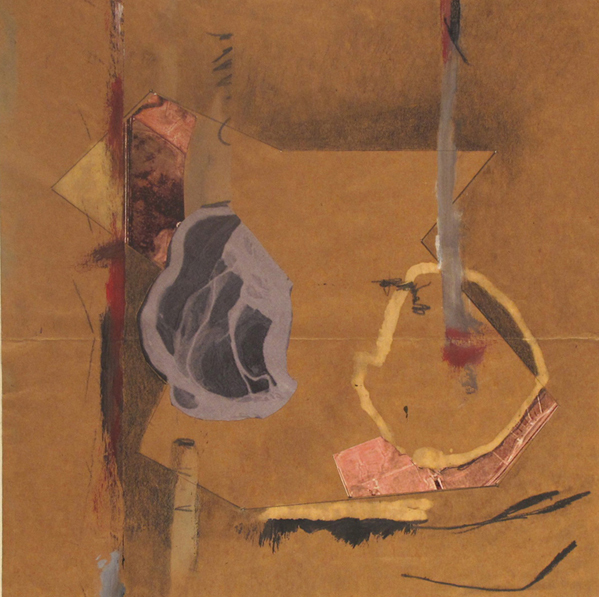 BR: Since the brown paper series was abstraction of the original drawings, I felt free to occasionally alter the colors. If you look at many Google images, you will see that some are done with different types of filters which change the natural colors of the Earth, but remember most of the color was already on the paper from the old drawings. VBA: Inconceivably, you aesthetically blasphemed technology, hinted at interiority and feeling, while unerringly mimicking stylistic veins of modernism. I attribute this to significant art historical knowledge. Besides early twentieth-century painters, from whom do you take inspiration? I’m actually wondering about influences closer to home, because just last week I had the opportunity to see Stout’s recent works, and glean his Romanticism in your art. You would have had the opportunity to watch him up-close when you did your graduate school teaching. BR: I would say that I was fortunate to have studied with a diverse group of artist and architects, but Richard Stout really inspired my drawing, and was instrumental in making me see things from so many different levels. Others who influenced my work were Donald Barthelme, and Bob Lindsey architecture, and James Surls, John Alexander, Gael Stack, Ed Hill, and Sal Scarpitta. All of them taught in the University of Houston fine art department. VBA: What other contemporary artists do you look to? BR: I like the work of Julie Mehretu, and Terry Winters. VBA: Bob, I think you are in harmony with Mehretu because of your love of architecture. When I read about the large mural she did in Manhattan, I learned it has a layer of architectural renderings beneath painted abstraction. She has said her interest in geography and architecture inspires drawings that look like aerial views of cities, and she uses the computer as a drawing tool. Her art has been associated with Malevich, Kandinsky, and other early century Russians, as well as Picasso and Mondrian. BR: And remember I’m inspired by Miro, Ernst, and Yves Tanguy.